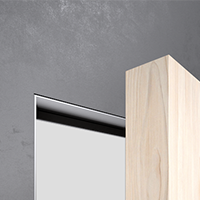 Lining doorframes with aluminium profiles makes them look like a picture frame. Doorframes for swing doors with revolving hinges. Hidden, grooved, groove-less, etc.